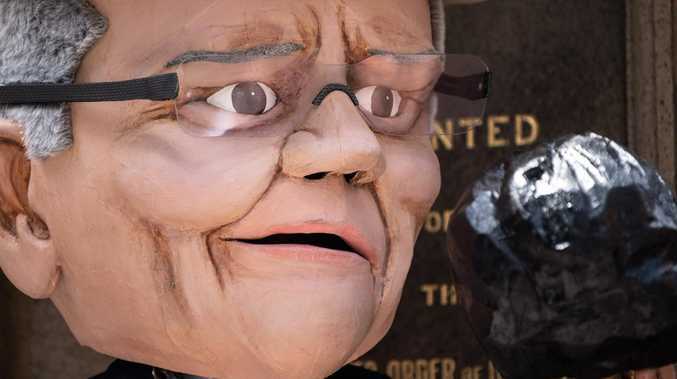 A protester dressed as Scott Morrison holding a piece of coal at Sydney’s climate change rally. Picture: James Gourley/Getty Images. 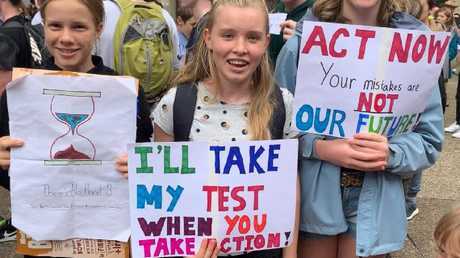 THE rain may have been spitting down on the crowd at Sydney's Schools Strike 4 Climate protest but it couldn't distract the students from wildly cheering each and every speaker who made their way up Sydney's Town Hall steps to address them. OK, there was one thing that distracted them. A giant inflatable earth that bounced around their heads. It tore the teens' gaze from the impassioned speeches as they batted it on its never ceasing journey. Beneath the ball were an estimated 25,000 teens, hundreds of parents and grandparents and one Jimmy Barnes who had come with his granddaughter. As the globe rolled over her, thirteen year old Sequoia had more reason them most to be worried about her presence at the protest, one of many being held around the country. While all of the other students news.com.au confirmed that definitely had their parents blessing to attend and their teachers at least knew they were here, that wasn't the case for Sequoia. "My teacher doesn't know I'm here," she confided. "Today I had a history test I was supposed to be taking. But this is more important than a history test. I should be here. I want to see the politicians do something that isn't fake". 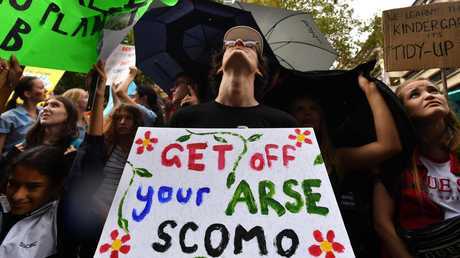 And of those politicians one face and name came up more than any other at the rally - Prime Minister Scott Morrison. "Stop going in Sco-Motion," said one banner. "Get off your arse ScoMo" said another. "ScoMo has kids?!!!" another banner said incredulously. Other students were even more cutting when it came to their feelings about the Prime Minister and his, and others, ongoing pleas for students to remain in class rather than protest. 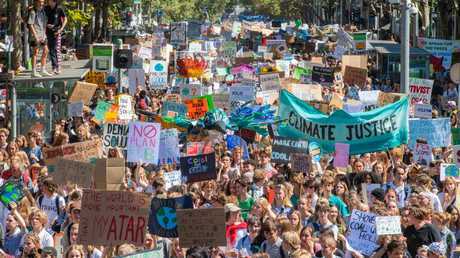 He made the classic adult mistake - expecting a teenager to do what adults tell them, said Jean Hinchliffe, one of Schools Strike 4 Climate's lead organisers. "I think everyone here heard ScoMo but I don't think he thought about the fact that if you tell a teenager they shouldn't do something, they're not going to listen. "Everyone knows he's such a knob that they wouldn't have listened to him whatever he said." The aim of the protests, which occurred throughout Australia and beyond, were three fold, Jean said. 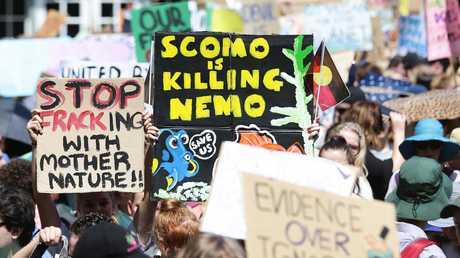 First, stop the Adani mine in Queensland from progressing. Second, ensure no new sources of fossil fuels. And third, 100 per cent renewable energy by 2030. 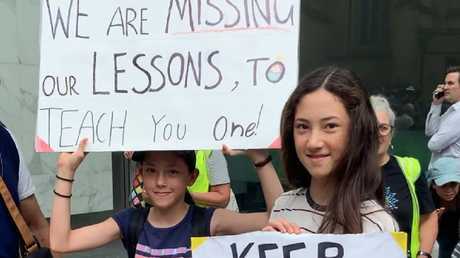 "We wouldn't be here if (Morrison) bothered to do his job because right now climate change is real and we cannot wait around until we're in power because then it will be too late." She said she was amazed at the sheer size of the crowd. "If I had 500 people that would be insane and we have tens of thousands right now." Jean Hinchliffe was one of today’s lead organisers. Picture: AAP Image/Monique Harmer. Back in the throng Hannah, 15, was also missing a test, in maths, but she was sure she'd be able to re-sit it. Like Jean, she was also somewhat underwhelmed by the prime minister. "I think ScoMo is an absolute idiot," she said. Her chief concern was Adani: "It makes no sense other than profit and jobs." Aren't both of those pretty big reasons to build the massive mine though? "It's destroying the planet. Due to climate change there won't be a planet in the future if this coal mine gets built because they produce so much carbon. It's not OK."
Hannah addressed the suggestion that kids were being "indoctrinated" at school. 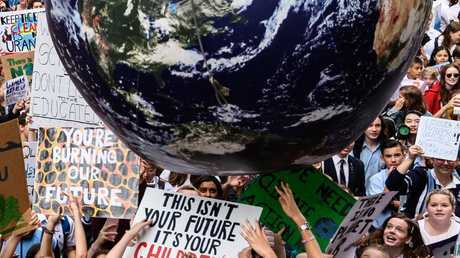 "If they don't want us protesting maybe they shouldn't be teaching us about climate change in school." Somewhere in the crowd, perhaps spurred on by the bouncing ball's popularity, a teenage boy was hoisted into the air at one point and began crowd surfing, further amping up the excitement. Lily Caddle, just 11, was one of the youngest people at the rally. She said she was "pumped" to be there. "If they're not going to do this, kids need to take a stand," she said. "We need to teach the PM a lesson". Lily's dad Ed said he was keen to bring her along: "I'm trying to encourage my kids to think about climate change without make it too depressing and today is very positive". Jimmy Barnes had come along with his granddaughter Tyra Harrison. Barnes said he admired the protesters: "I'm probably not going to be around for that long but this is their future and they're protesting because they want to have a world to live in. They're sick of it, I'm proud of them". 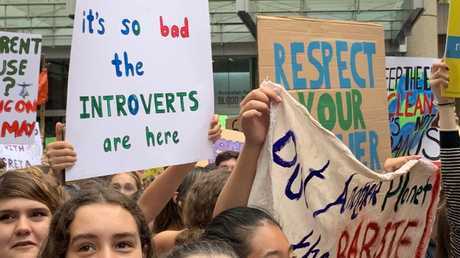 Robin and Warwick proved it wasn’t just teens at the climate change rally in Sydney. Picture: Benedict Brook. 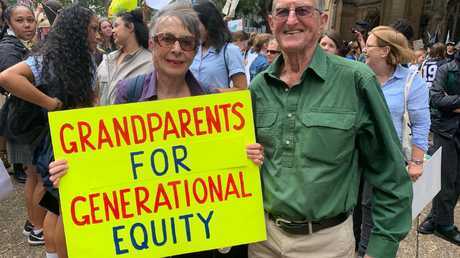 Grandparents Robin and Warwick Mosman also stood out among the sea of exuberant teens. They had come with their granddaughter but acknowledged it wasn't exactly their demographic. "But I feel it passionately it should my demographic who cares about this," said Ms Warwick. 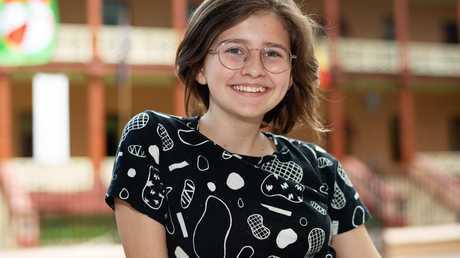 "My generation have lived through the best time in Australia and the world and I don't see that being a future that's going to be possible for my grandchildren if we don't take urgent action on climate change." Where their grandchild was though they weren't quite sure. "We've lost them. She's with a group of friends and I think she wants to be with them." Mr Warwick added that they didn't want to cramp her style. As the speeches, and the screams, went on the blow up globe continued to do the circuit of the crowd. But in a perhaps ominous sign it was deflating. The once full and healthy blue and green ball, light as a feather, was now dull, flaccid and flabby. Eventually, exhausted of air, the earth sank and fell defeated to the floor below. 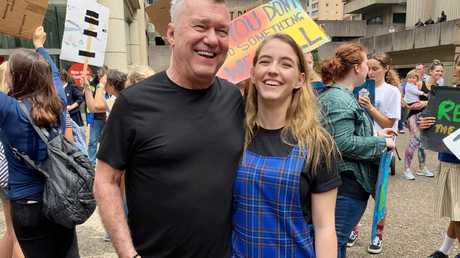 Jimmy Barnes was at the rally with his granddaughter Tyra. Pictures: Benedict Brook.